Will.i.am is producing Britney Spears' new album and has said he won't let it include "another song about going on the dance floor". The Black Eyed Peas star confirmed to Rolling Stone that he would be executive producing Britney's next album but wanted to get to know her really well first. He said: "I was like, 'OK, look, guys, me and Britney need to have lunch four times a month for three months before I even try to go in the studio with her because we need to talk. "We need to talk about what she's excited about in life. I gotta talk about the things that hurt her. I gotta talk about the things that make her concerned - she's a mother. I gotta talk to her about all the things that her fans want to talk to her about. "I gotta be the vehicle between her and her fans. We can't do another song about going on the dance floor. Really? Didn't we see a bunch of Britney doing that already? Don't we want to see something that comes from her heart?" The Voice UK coach said Womanizer singer Britney had been impressed with their previous work together. "After I did a song on Femme Fatale - Big Fat Bass - and then we did Scream And Shout, she really liked the way we worked because of my approach." The pair will start working on songs in the next few months but have no idea of a release date for the album yet. Will.i.am wouldn't confirm who else will work on the album but did say that Britney likes Diplo, who is rumoured to be involved. He also talked about his upcoming tour: "I'll probably be on a real tour in September. But I don't know if I'm gonna tour America. I'll tour everywhere else, but not the States. It's a weird place to tour. It's gonna be cool. [But] I don't want to reveal how I tour." Chris Kelly of the 1990s rap duo Kris Kross, who made one of the decade's most memorable songs with the frenetic Jump, has died of an apparent drug overdose at the age of 34. Lauryn Hill says she has signed with Sony to pay her overdue taxes. 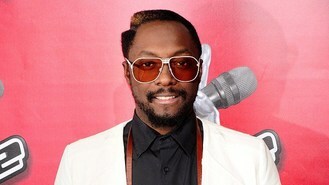 Will.i.am says he's been unfairly accused of stealing a song from a Russian dance producer. Long-standing music festival All Tomorrow's Parties is to end its popular seaside events featuring an array of indie acts and curated by cult figures. The Wanted have apparently named their new song after Rihanna. Michael Buble has said he feels like a "real New Yorker" after serenading commuters on the New York subway to promote his new album. Oritse Williams has broken down in tears as he discussed JLS' split on TV. The Wanted's Nathan Sykes has revealed that he is "happy to be home" after undergoing emergency throat surgery. Liam Gallagher has said it will take a lot of money to get him to reprise Oasis.